This weekend it will be time to give the ladies some due, as the best female fights outside of the UFC will clash at Invicta FC 6. Invicta is kind of the little engine that could, with Shannon Knapp tackling the world of Women’s MMA head on and treating it like a legitimate sport that deserves respect, which is exactly what it has gotten. 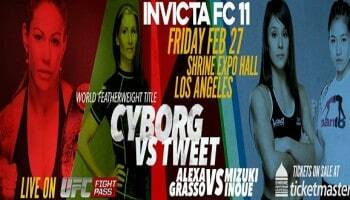 This weekend Marloes Coenen and Cris “Cyborg” Santos will clash for the second time at Invicta FC 6 and today they released a countdown video, Invicta FC 6: Road to Coenen vs. Cyborg. Go ahead and watch it here and get hyped up for Coenen vs. Cyborg.